206 pages | 166 Color Illus. 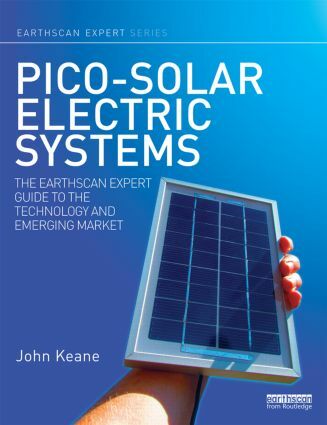 This book provides a comprehensive overview of the technology behind the pico-solar revolution and offers guidance on how to test and choose quality products. The book also discusses how pioneering companies and initiatives are overcoming challenges to reach scale in the marketplace, from innovative distribution strategies to reach customers in rural India and Tanzania, to product development in Cambodia, product assembly in Mozambique and the introduction of ‘pay as you go’ technology in Kenya. Pico-solar is a new category of solar electric system which has the potential to transform the lives of over 1.6 billion people who live without access to electricity. Pico-solar systems are smaller and more affordable than traditional solar systems and have the power to provide useful amounts of electricity to charge the increasing number of low power consuming appliances from mobile phones, e-readers and parking metres, to LED lights which have the power to light up millions of homes in the same way the mobile phone has connected and empowered communities across the planet. The book explains the important role pico-solar has in reducing reliance on fossil fuels while at the same time tackling world poverty and includes useful recommendations for entrepreneurs, charities and governments who want to participate in developing this exciting and rapidly expanding market. John Keane is Managing Director and a founding member of SunnyMoney, the largest distributor of pico-solar lighting products in Africa. Previously, he was Head of Programmes for SolarAid, the international NGO that set up and owns SunnyMoney. He became acutely aware of the pressing need for affordable, renewable energy in off-grid communities from living in the village of Uhomini in rural Tanzania as a volunteer in 2000. He has since spent more than a decade leading and developing solar projects across east and west Africa and has played an instrumental role in building both SolarAid and SunnyMoney into respected international organisations.